In Guinea-Bissau, the situation on the surface often seems to belie deeper and darker problems facing the country. On 26 November, the headquarters of the African Party for the Independence of Guinea and Cape Verde (PAIGC) – the movement that led the liberation of Guinea Bissau – seemed set for a celebration; a Saturday afternoon party. 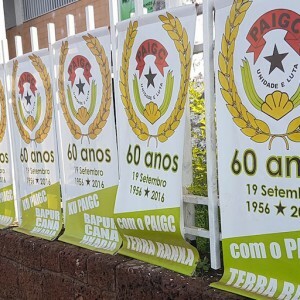 Loud music boomed from speakers, and people laughed and talked excitedly in the auditorium, which was bedecked with flags and a large banner celebrating PAIGC´s 60 years. Slowly, the auditorium filled up. But the festive atmosphere masked the gravity of the situation, and did little to foreshadow what would later unfold. A few hours into the event, the PAIGC issued a ‘no-confidence’ communiqué to the President of the Republic, José Mario Vaz – who is from the same party. The communiqué is symbolic of continued instability within Guinea-Bissau’s fractured political system, where ongoing tensions between actors threaten fragile peacebuilding gains. The crisis has led to engagement from a multitude of international organisations and stakeholders. The United Nations (UN), the Economic Community for West Africa (ECOWAS) and several bilateral donors and partners have all been involved in missions, mediation processes and political frameworks aimed at achieving sustainable peace and preventing conflict. The African Union (AU) has also shown interest in increasing its currently small presence and role in the country. Such increased engagement would form part of efforts to revitalise the AU post-conflict reconstruction and development (PCRD) framework, and is part of a process where the AU expects to have a greater impact in assisting post-conflict states. The process would be initiated through the development of a post-conflict needs assessment. In Guinea Bissau, international responses to the crisis have often included analysis and needs assessments aimed at understanding the root causes of the crisis. Needs assessment missions are a way for organisations and actors to identify their own strategies; plot appropriate courses of action; and to mobilise resources and expertise. While taking cognisance of the complexity of the situation, it is crucial that when international actors assess their roles, they avoid ‘reinventing the wheel’. Guinea-Bissau’s political system can be described as a continuous, albeit confusing, process of instability, coups and frequent changes of government. Since independence in 1974, no elected government has been able to complete its mandate. After a transition of two years that followed the 2012 coup, the country organised elections, leading to some degree of optimism. But just when stability seemed to be in sight, a new wave of tension once again ravaged the country. The PAIGC has been on a war footing since the 2014 Congress of Cacheu, where the Congress nominated Vaz to be the future president-elect of the republic. This increased the deep division between groups supportive to Vaz and those in favour of the party president, Domingos Simões Pereira. Since the Congress of Cacheu, five different prime ministers have been sworn in and now, in January 2017, the institutional crisis seems to continue. ECOWAS, which has had a long history of engagement in the country, has been leading a negotiation process since the second half of 2016. The process has brought together different political figures, religious leaders and civil society representatives. But while political agreements were reached in Bissau and Conakry, they had little influence on the political and institutional crisis. Certainly, the lack of success of Guinea-Bissau’s peacebuilding processes is not due to a lack of efforts to understand the dynamics and root causes of the conflict. Plans to get the country out of instability exist, and plenty of them: national development plans, strategic visions, priority plans and fragility assessments abound. Nationally, the government developed two iterations of Poverty Reduction Strategic Papers, which were overtaken by a national strategic vision under the name of Terra Ranka. More recently, in the context of the New Deal for Engagement in Fragile States, Guinea-Bissau is developing a fragility assessment to once again identify root causes of stability and its potential trajectory towards sustainable peace. Internationally, the UN developed its own range of plans to inform strategic direction in the UN’s responses and progress monitoring, including the Strategic Assessment Mission, Peacebuilding Priority Plans and UN Development Assistance Framework. For the AU, previous assessments and plans provide several lessons on how it might succeed in increasing its engagement. The plethora of existing plans must be assessed, since it is clear that these are far from being effective. Some of these plans read more like shopping lists than lists of priorities. This raises one of the most critical challenges to effective, sustainable peacebuilding in Guinea-Bissau: that many of the plans end up paying little attention to what is actually required (from a technical and political level) to achieve the intended results. As an important first step, the AU should build on existing assessments. The above-mentioned plans mention similar trends and causes. For instance, they all refer to the importance of addressing the role of the military, and the need for security sector reform. The challenge posed by the lack of development is also emphasised, particularly with regard to social cohesion. The various needs assessments and plans also refer to the importance of strengthening institutions – including political parties and the national assembly. Recent lessons show that it is critical to avoid making decisions without questioning viability, along with existing and future political buy-in. The recent attempt to achieve some degree of stability through the ECOWAS mediation process highlights the importance of identifying long-term needs. The mediation calls for a roundtable process to be created, which would develop a stability pact and identify future courses of action. However, since the signing of the agreement in Conakry and Bissau, very few people actually believe that the process might actually yield stability and resolve the political impasse. And what can be done to avoid a level of cynicism in developing new approaches? It is critical that in developing action plans, actors like the AU don’t only identify what needs to be done, but further provide a critical analysis of whether and how it can be done, including the means to ensure that responses are effective. Existing frameworks must be utilised, critiqued and advanced. By bringing that discussion to an internal bureaucratic and institutional context, the AU would be able to identify its own comparative advantages and institutional capacity to be effective. In Guinea-Bissau, the realities on the ground often obscure the deeper causes of instability that bubble below the surface. For the AU, it is critical to acknowledge and deal with both. In identifying its potential and current roles in Guinea-Bissau, the AU must have the courage to reflect and identify its own strengths and weaknesses, not only the dynamics on the ground. As such, courage is required to support the development of plans that read less like shopping lists, and more like actual guidelines that could realistically assist the country in overcoming fragility.